Okay, after missing alot of the challenges for one reason or another, I have finally found one that I think I could actually do. I stumbled upon this challenge through Bermudaonion's Blog who posted about it, and it's being hosted by Booking Mama. The challenge is based on the book by Lizzie Skurnick called Shelf Discovery: The Teen Classics we Never Stopped Reading.This book, as Publishers Weekly states, is an "omnibus of meditations on favorite YA novels that dwells mostly among the old-school titles from the late '60s to the early '80s much beloved by now grown-up ladies." In other words, it talks about many of the books I grew up reading. So what is the challenge about? Reading (or re-reading) childhood classics and favorites. The Shelf Discovery Challenge will run for six months (November 1, 2009 - April 30, 2010). To join me in this challenge, all you need to do is grab a copy of SHELF DISCOVERY and pick out what six books you want to read (of course, you can read more than six!) Then, after you read a book, just write a "book report" to share your thoughts with others! Grab the challenge button at the top of this page and write a post detailing what six Shelf Discovery books you are going to read within the next six months (you always have the option to change your original list -- I'm flexible like that!) If you don't already have the book, you can browse the table of contents here. 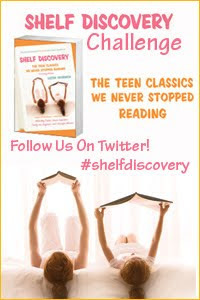 Once you have posted your Shelf Discovery challenge post, come back to this post and click on Mr. Linky. Please leave your name and link directly to your introductory post (not just to your blog’s home page.) If you don’t have a blog, no worries -- you can just leave a comment on this post telling me you want to participate. So is anyone else up to a fun challenge? Great list! You picked three of my childhood favorites. I am still thinking about my list-- how pitiful is that? I think we're going to have so much fun! I think this challenge is going to be so much fun! I'm glad you've signed up. I'm thinking about adding A Wrinkle in Time to my challenge list also. Good luck! This sounds like a great challenge. I need to do it just to read some of these books that I'm embarrassed that I didn't read when I was a kid--A Wrinkle in Time, Little House on the Prairie, etc. I spent too much time reading Nancy Drew and Trixie Belden I guess. Ooohh...I loved reading Nancy Drew and The Hardy Boys, but I never heard of Trixie Belden. I have to check it out for my daughter. I have a whole collection of the original Nancy Drew books that were given to us. Can't wait for my girl to start reading them.